Glastonbury is a small town in the Mendip District of the county of Somerset in South West, England. It is situated at a dry point on the low lying Somerset Levels. 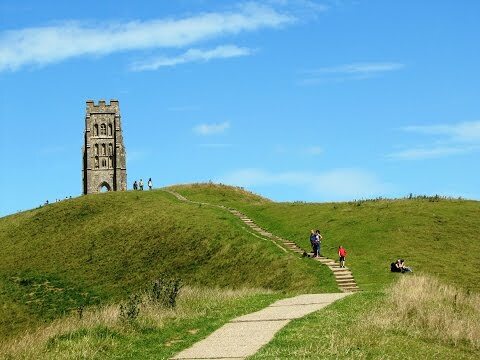 Glastonbury is said to be a New Age community attracting people with New Age and Neopagan beliefs and is known by its myths and legends related to Glastonbury Tor, Joseph of Arimathea, the Holy Grail, King Arthur and the legendary Island of Avalon. One legend is that of Joseph of Arimathea who planted his staff on Wearyall Hill where it took root. It flowers twice a year in spring and at Christmas and on Christmas Day every year a sprig of this Holy Thorn is sent to the Queen and placed on her dinner plate. Glastonbury Abbey is England’s largest abbey set in 36 acres of parkland providing beauty, tranquillity and a place to relax or the children to play. In the beautiful grounds there are many types of trees, wildflowers and two wildlife ponds where the children can feed the ducks and carp. The abbey is open every day except Christmas Day there is an admission fee, seasonal tickets are available, and if you retain your ticket you can come and go all day. The Church of St. John the Baptist is 15th century built of stone from the villages of Doulting and Street and also the local Tor burr. The tower is 134ft (41m) and is the second tallest church tower in Somerset. Glastonbury Tor is a hill with the 14th century St. Michael’s Tower on the summit. The roofless tower has been designated as a Scheduled Ancient Monument and can be seen for many miles around and from the top of the Tor the views are magnificent of the flat Somerset countryside. The Tor is situated in the middle of a plain called the Summerland Meadows which is part of the Somerset Levels and the site is managed by the National Trust. At the base of the Tor, just off the A361, is the White Spring where there is two types of water, Ironstone and Limestone both are drinkable, also this is where you can be cleansed. The Chalice Well and Gardens which is a place of sanctity, healing and peace to soothe the soul and revive the spirit is just round the corner on the main road. Our stay in Glastonbury coincided with the Goddess Conference and Womanspirit Exhibition which has taken place here for the last 16 years. It has been a very interesting and an eye opening experience. Just half a mile west of Glastonbury there is a footpath that takes you into the Nature Reserves of the Somerset Levels which is a nice easy walk, part of which is suitable for wheelchair users, and is well worth a visit. The Somerset Levels are full of wildlife such as Heron’s, birds of prey , white egrets, giant muscles, dragonflies and red admirals just to name a few. On leaving the car park in Glastonbury we turn right and head for the Abbey. We spend a few hours at the abbey following a tour guide and wandering round the grounds. We leave the abbey turning right towards The Crown then right up the high street to the road at the top. Here we take the road opposite named Bove Town we then follow this road until we reach Old Wells Road which turns sharp left and with a white thatched cottage on our right we keep heading forward up the smaller road which bends round to the right. We keep following the road until we come to a t-junction and a gate opposite with a sign Tor this way. We turn left following the arrows until we reach the gate and entrance to the Tor. We go up to the top of the Tor and then down on the other side. At the bottom we just follow the path until we come to a road. Here we turn left to have a look at the White Spring then back down to meet the main road (A361). Here we turn right, we pass The Chalice Well and Gardens then at the small roundabout we turn left and follow the road turning right at the next bend back into Glastonbury. This is an easy walk round Glastonbury Abbey and town. Glastonbury Tor is a moderate incline and decline. Approx 2.75 miles using OS map 141. Mileage does not include Glastonbury Abbey. Glastonbury in the County of Somerset. From the M5 take the A39 at junction 23 then the A361 into Glastonbury centre. There are five car parks and also roadside parking around the town. There are two toilet blocks in Glastonbury one in the car park with facilities for the disabled and the other on the main road next to the car park. There are also public toilets, with facilities for the disabled, in Glastonbury Abbey. For refreshments there are plenty of shops, cafes and pubs in Glastonbury.